When their parents disappear in the middle of the night, young sisters Summer and Bird set off on a quest to find them. A cryptic picture message from their mother leads them to a familiar gate in the woods, but comfortable sights quickly give way to a new world entirely--Down--one inhabited by talking birds and the evil Puppeteer queen. Summer and Bird are quickly separated, and their divided hearts lead them each in a very different direction in the quest to find their parents, vanquish the Puppeteer, lead the birds back to their Green Home, and discover the identity of the true bird queen. With breathtaking language and deliciously inventive details, Katherine Catmull has created a world unlike any other, skillfully blurring the lines between magic and reality and bringing to life a completely authentic cast of characters and creatures. 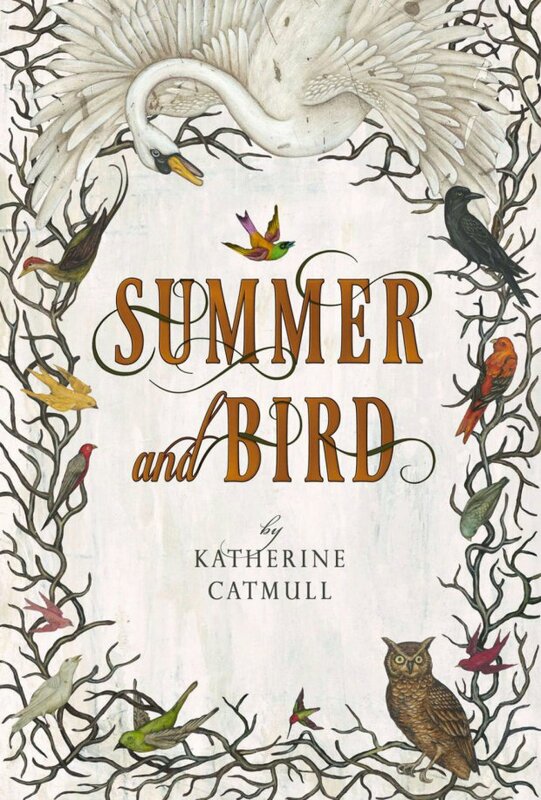 Summer And Bird by Katherine Catmull was basically my number one book to obtain at BEA 2012, five whole years ago. I really wanted the book to read at the time because the cover is absolutely perfect. Plus, I was going through a phase where I read a lot of middle grade books. Also, I just have this thing for birds. So, it was a huge deal when I managed to score a copy. I then didn’t read it until 2014 and actually did not finish until May 2017. This is because I am the worst and also because I put this book on pause because it just could not manage to hold my attention. Katherine Catmull’s Summer And Bird follows two siblings who happen to be named Summer and Bird. One day both of their parents disappear from their home in the middle of the night. And so, the two decide to search for their parents in the woods. They get separated. Bird ends up with a character called the Puppeteer who promises Bird that she will be Queen of the Birds, although a swan holds that title. However, the swan has been missing for years. Summer ends up following a map in search of Bird and coming across a person-bird called Ben. There, Summer learns the truth about her parents and her mother, especially. She then makes it her mission to reunite with Bird. Ultimately, the two must come together again to help lead the birds to the Green Home. Summer is the older sister. She comes across as a bit more responsible than Bird. She’s very concerned with finding first her parents, and then upon the separation, Bird. Summer doesn’t get totally waylaid the way that Bird did. It is a fairly interesting contrast. As for Bird, she’s young and it shows. She is seduced by the idea of being Queen of the Birds. She strongly wants to learn to be a bird, it is basically her life’s mission. There’s a whole reason why too that does end up making sense once you get into it. Ultimately, I am not entirely sure how much I recommend Summer And Bird. I read a lot of books that you might consider slow and meandering. This book was so slow for me, that it took me a few years to actually work up the energy to finish, and even once I got back into it, it still took longer than expected. I can imagine your typical middle grader maybe not having the enthusiasm or being engaged enough with the pacing to finish this book. It is creative though and the world building is fabulous, just the pacing of it really left something to be desired. I love that cover. I’ll have to check it out.